Intersegmental Traction is a way of inducing passive motion into the spine for the purpose of flexing spinal joints, increasing mobility, and preventing disc degeneration. Intersegmental traction works as the patient lies face up on a bench table that has roller-type cams beneath its surface. These rollers can slowly travel the length of the spine, flexing the spinal joints. 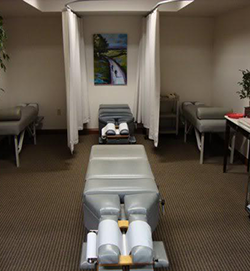 Most patients find this form of therapy the be relaxing and very helpful. Since discs have a poor blood supply, they get nutrients from the circulation of fluid surrounding the spinal joints. Fixations prevent this natural circulation and can cause disc thinning and degeneration. Intersegmental traction helps increase and restore necessary elasticity and motion of the spine. Rapid Release Therapy is a nonsurgical, noninvasive, and drug free solution for the treatment of soft tissue disorders. RRT is safe, effective, and fast. It is the only high frequency vibration therapy that will reduce pain and increase range of motion by releasing scar tissue, adhesions, and easing chronic and acute muscle spasms. This therapy is effective in reducing the pain associated with joint sprains, strains, arthritis, tendonitis, bursitis, muscle spasm, nerve pain, and most musculoskeletal disorders. We want you to relax, enjoy and fully benefit from your chiropractic care. Ready to get started? Give Settimi Chiropractic & Wellness Center a call.